I just put a lithium battery in my 2002 Yamaha Virago 250. The proper size lithium battery is too much money to stay within my “minamalist/low cost” plan. This battery that I bought (used for $35) is normally used in 50cc mopeds, but it will work in my 250 if I do the following. 1) I will crank engine with the headlight off. The electric starter switch has a second circuit that turns off the headlight and speedometer light when you hit the starter button – I know that this works but I like the idea of an separate switch – I think that you get a little more voltage when you first hit the start button, plus you need a separate switch anyway for when you bump-start it. 2) I changed to Shell T6 synthetic 5W30 – that helped cold weather starting some but still not enough. 3) I added a switch below the seat to turn off the tailights and running lights when starting in cold weather. The blue wire under the seat goes from the ignition switch to the rear tailight and the front running lights. 5) I re-wired the neutral indicator bulb to be turned “off” by the start switch when when I am starting the engine. To do this, I replaced the brown (positive) wire to the neutral light with the blue/black wire which goes from the start switch to the headlight and speedo lamp. The electric starter switch has a second circuit (output is blue/black wire) that turns off the headlight and the speedometer lamp when you hit the starter button – by doing this, it will turn off the neutral lamp as well. 5a) Instead of doing item 5 (re-wiring the neutral bulb), I could have replaced the 3 watt neutral indicator bulb with an LED to make cold weather starting easier. Stock bulb is number 42X-83517-00-00. LED replacement is T6.5 or T5. 6) I put LED bulbs in my turn signals and tail-light. I will be using only LED lights except for the headlight. 7) I will monitor the two carb heaters (my bike has a 30 watt and a 20 watt carb heater) using an LED indicator light. If the carb heaters cause a problem, I can add an on-off switch. The carb heaters use no power except when the temperature is below the switching point (about 58° F) of the diode in the left airbox. 8) I will monitor the voltage as I drive (I got a voltmeter for $3.45). If it is too high, I can turn on two 55w driving lamps that I normally do not use. If the voltage falls too low, I will turn off the headlight, and if that does not help, I can pull over and let it sit about 30 minutes – the battery might recover enough that I can keep driving. 9) Next I am going to try putting a relay on the TCI – hopefully this will get me a little more voltage to the plugs. 10) I am going to wait on this one – I could run one half 5W20 and one half 5W30 – this would give me a weight of about 5W25 . 11) To be done in future if needed – Increase the idle speed a little to increase the stator output when idling. A lithium battery like this should not be charged above 14.4 volts or allowed to be drained below 9.0 volts. Stock 10 amp/hour XV250 battery– 10 Ah/ weight 9.46 lbs or 4.3 kg / 5.3” L x 3.4” D x 5.8” H / 8 times larger and 18 times heavier than the 4 amp/hour lithium battery. With the lithium battery, my battery weight went from 9.5 lbs to 0.5 lb (4.3 kg to 0.2 kg). Also I am trying to lose 20 lbs myself (lost 3 lbs so far); if I succeed, the bike’s total weight will be reduced by 29.0 lbs or 13.2 kg, and my 22 hp Virago 250 would perform as though it had 23.3 hp. Since I put foam under and around it, it takes up about the same amount of space as the original battery. If you needed the space, the 4 amp battery is so small that you could mount the battery beside the flasher and relay that are behind the right cover. Then the original battery box would be completely empty. edit 9/23/12 – Now that summer is over, the 4 amp battery is not enough to start the bike when it is lower than 55° to 60° F – so I have to push start it in the morning. It starts fine in the afternoon (temp above 60° F). I drove it to work today (94 miles) and the voltage gauge stayed between 13.1 and 13.2 volts – so that is good. My gauge is connected to small wires near the headlight; I would get higher readings if it were connected more directly to the battery. Everything seemed normal. The voltage regulator ran in the normal temperature range – mostly 106° F to 109° F (41° C to 42.8°C). The bike seemed energetic and strong – maybe even more than normal, but that could have been my imagination. Weight reduction was 9 lbs for the lithium battery plus I lost about 2 lbs myself this week – so there might have been a difference in the acceleration. I charged the 4A lithium battery with a small (1 amp) charger for 90 minutes and damaged it – the battery has almost no output now. I took the battery apart and there was nothing I could do to get it going again. I am an experimenter and I find that I learn more when an experiment fails, so I normally am not bothered when things go wrong – but I was a little disappointed. 3*) I am not a battery expert, but I think a Lithium battery loses more power in the cold than a regular battery (lead acid or AGM). 4*) I did not test this, but the 4 amp Lithium might start the bike at 45° F if I put an oil pan heater near the battery for at least an hour. 5) Once the bike warms up, the battery area runs about 20° F hotter than the ambient temperature, so cold startup was the main problem for the small Lithium battery. 6) For a Virago 250, a 4 amp lithium battery can power only one non-LED accessory at a time. For example, if you want to run grip heaters (on low), you need to turn the headlight “off”. I replaced the toasted 4 amp lithium battery with an 8 amp AGM battery. 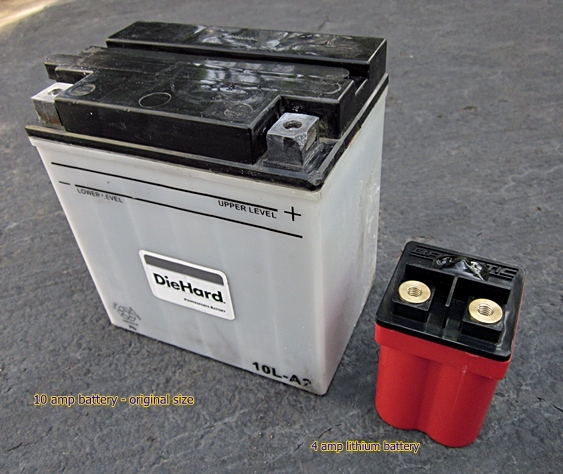 The battery that I bought: 8 amp/hour YTX9-BS AGM battery– 8 Ah/ weight 6.4 lbs or 2.9 kg / 5.875” L x 3.38” D x 4.25” H / $25.50 shipped / weight reduction 3.1 lbs.